I love a good muffin and so does my daughter for that matter. Goodness knows I’ve posted my fair share of them, hopefully you all are as obsessed with them as I am; otherwise I apologize for yet another muffin recipe! But I feel like lately we have been in a bit of a breakfast rut, scrambled eggs or french toast for her and cereal for me. So Monday I decided to end said rut by whipping up these muffins and boy am I glad I did. The muffins turned out quite tasty = a raving success with the little one. 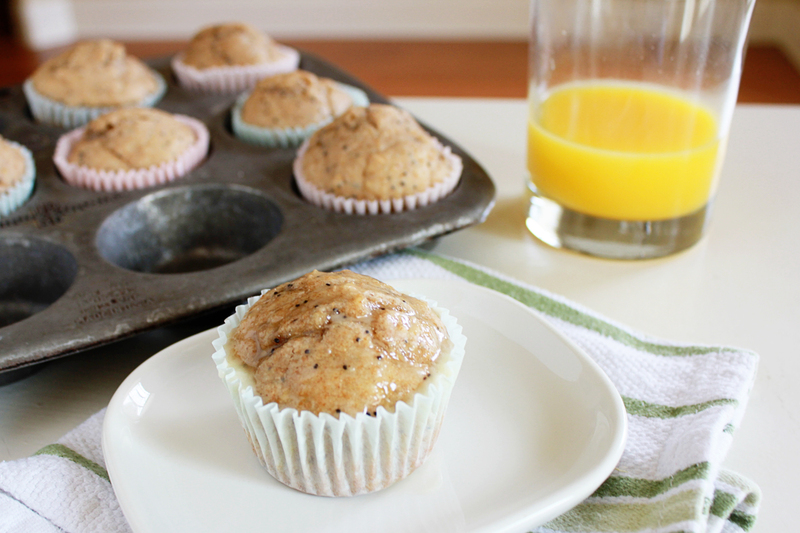 A lightly sweet, delicious blend of citrus and poppy seeds to start your morning off right, enjoy and happy baking! Preheat your oven to 375º and line a standard 12 cup muffin tin with paper liners. In the bowl of your stand mixer combine the banana, egg, yogurt, sugar, lemon juice and orange juice. Once the mixture is smooth add the poppy seeds and stir to combine. Sift in the flour, baking powder, baking soda and salt; stir until it just comes together. Spoon the batter into the paper liners and bake for 18-20 minutes. Remove from the oven and cool 10 minutes, drizzle with the glaze and serve. I love a good muffin too, specially ones with yoghurt in. These look delicious! Newest follower here! I found you through the Monday link up! Cute blog, I can’t wait to read more! I just love your blog format and pictures!!!! Yum, these sound just delicious! !